You hear the smoke alarm in the middle of the night. You know how you will get your family to safety, but have you made a plan to keep your pets safe? House fires are dangerous, devastating events for all occupants of a home, but they’re especially dangerous for pets, who will usually try to hide rather than try to escape. Cats especially will seek out a hiding spot or flee unfamiliar-looking rescuers. This can lead your pet to inhale smoke and toxic chemicals or expose him or herself to flame, which can then cause serious health problems. Pet fire safety is such an important issue that there’s actually a National Pet Fire Safety Day, observed each year on July 15th. While that’s a good yearly reminder, it’s important to know how to protect pets from fires all year long. In fact, as we head into the fall and winter months, the chance of fire will actually increase. December, January, February, and March are prime months for house fires due to an increase in space heater use, candle burning, cooking, and faulty wiring on holiday lighting displays. On average, U.S. fire departments respond to a home fire every 86 seconds. It’s estimated that approximately 44% of all households in the United States have a dog, and 35% of households have a cat. Add that up, and that’s a huge number of pets at risk. Home fires affect about half a million pets each year, according to the National Fire Protection Association. Pet fire safety is not difficult. Fortunately, there are steps you can take to prevent house fires in the first place. Should a fire break out, a good evacuation plan can help you rescue your four-legged friends along with the rest of your family. If a rescue isn’t possible, there are ways to help your pet recover from smoke inhalation and burns. The first step is prevention, and pet owners have more to worry about than the rest of the population. Anyone who has ever lived with a curious, energetic cat or dog should not be surprised to learn that about 1,000 fires each year are caused by pets themselves. Imagine your large dog bumping a knob and switching on a stove burner while home alone, or a cat deciding to investigate a burning candle and accidentally knocking it over. Never leave pets unattended around open flames. Better yet, use flameless candles instead of the real thing. Remove the knobs from your stove when you’re not using it, or invest in baby-proof knob covers that will keep the knobs from turning if your dog bumps into them. Pets often chew on electrical cords or electric blankets, and the frayed wires can spark and start a fire. Secure cords behind furniture or in places your pet can’t get to them, and unplug them when your pet is unattended. Never leave your pet alone with an electric blanket. If you’re leaving water for your pet on a wooden deck, use ceramic or stainless steel water bowls rather than glass. When the sun’s rays filter through a glass bowl, the wooden deck beneath it can actually catch fire. 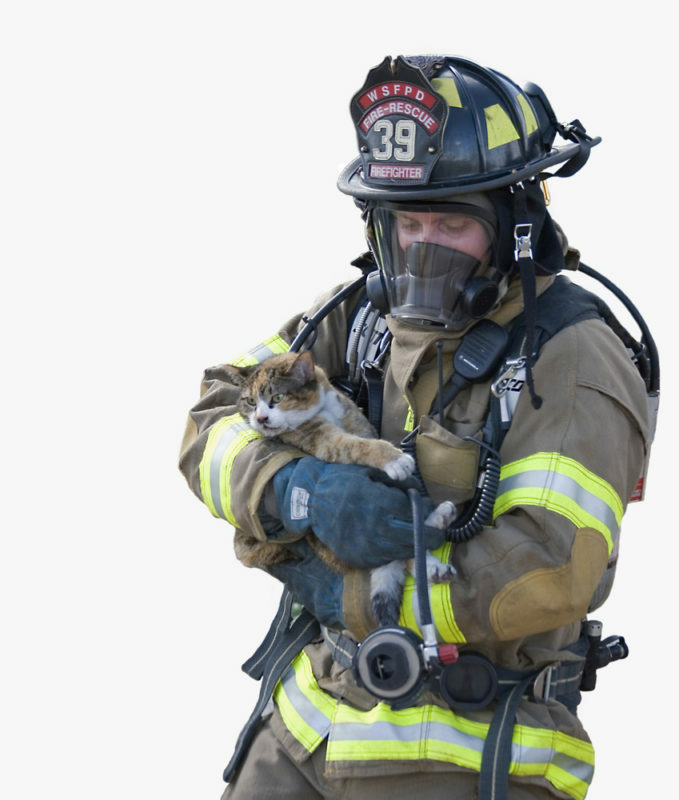 Take steps to ensure your pet will be safe and easily rescued should a fire break out. Have an emergency plan to evacuate your entire family and practice it with your dog or cat. Make sure every member of the family knows exactly what to do and where to go, and make note of your pet’s frequent hiding spots. Keep cat carriers and leashes in an easily accessible spot. As part of your emergency plan, compile an emergency kit you can grab quickly as you leave. Include canned pet food, a leash, your pet’s medication, and the phone number of your veterinarian. Display stickers on your windows to let firefighters know there are pets inside. You can get these stickers for free here at East End Veterinary Center, or at many other local shelters and pet clinics. When pets are home alone, keep them in a room near the front door so that firefighters can find them easily. Keep leashes or carriers near the door so that firefighters can easily bring them to safety. Difficulty breathing, breathing faster than usual, or breathing with an open mouth; your pet may also position their body to try to make breathing easier. There is help for pets who suffer from smoke inhalation and burns. East End Veterinary Center is the only veterinary facility in Suffolk County to offer Hyperbaric Oxygen Therapy, or HBOT. This veterinarian-administered treatment can be used to treat smoke inhalation and burns, reduce swelling, control inflammation, and stimulate new blood vessel formation in healing tissues. While Hyperbaric Oxygen Therapy is an excellent treatment for smoke inhalation and burns, it can be used to treat a variety of other conditions a pet may suffer from, such as anemia, arthritis, pneumonia, postoperative swelling, snake bites, and more. Your pet will rest comfortably for one to two hours in a large chamber. A pressurized flow of pure oxygen throughout the chamber allows more oxygen to enter your pet’s bloodstream, speeding up the healing process. Your pet will usually require two sessions each day until he or she is feeling better. If your pet has been exposed to smoke or fire, contact East End Veterinary Center, your specialty 24/7 emergency vet center for companion animals in Riverhead, NY. Appointments are not required to see a veterinarian in an emergency; however, you are encouraged to call ahead at (613) 369-4513 so our veterinarians can prepare for your arrival.